Minimates, huh? I never really got the craze for them - sure, they're cute, but isn't a real action figure better? Nonetheless, I've broken down and bought a few, for various reasons... and y'know what, their cuteness is kind of winning me over. Gina here is the main reason I picked up this two-pack - Number Six is scheduled to have two figures in the upcoming Diamond Select Toys line, but neither of them are Gina, the ill-fated Six who infiltrated the Battlestar Pegasus, got discovered, and had a very, very unpleasant captivity. I've got a soft spot for her, of all the Sixes - the poor woman went through hell, you can't help but feel for her - so seeing as the Minimate is her only action figure incarnation, I gave in. 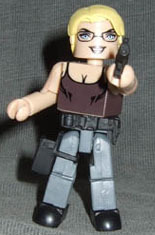 For the most part, she's very much your standard Minimate - a kind of super-charged Lego person, well-painted and well-articulated, but still fundamentally made of blocks. The female form never quite works as well as males do - the rectangular torso can approximate a well-built muscleman, but seductive curves are way beyond its capabilities - but the designers did the best they could. Her outfit tends to draw the eye to her chest, where the painted cleavage detail more or less works, rather than her sides and waist where no amount of paint can hide the fact that it's all right-angles, and the piece representing her hair is a good Minimate translation of Gina's hairstyle, which adds to the illusion that she's somewhat like an actual human. Gina's paintwork - which is most of what differentiates one Minimate from another - is pretty good. The only lapse is the edges of the torso block, where the paint doesn't quite reach the edge, resulting in thin skin-coloured edges - they're easy to ignore though, especially under normal household lighting rather than daylight or a camera flash. There are shading lines to suggest definition in her chest, and the edge of her tank top is clean, although the straps don't cover the "top" of her torso, over the shoulders - the blockiness of her helps minimise the visual impact of their absence, though. Her face is, naturally, rendered in a cute animated style, but there's a decent suggestion of her intelligence behind the smile. The glasses aren't quite accurate to the TV show, but lensless glasses would be very tricky to paint on, so it's enough that they suggest the right look for her. Her non-standard additions are an equipment belt, which adds a little to her height and has various pouches and whatnot sculpted onto it, and a thigh holster which fits her only accessory, a Colonial Military pistol. She has all the Minimate-standard articulation points: balljointed neck, shoulders, and hips, pin elbows and knees, swivel wrists and waist - she's quite capable of a variety of poses, and her smile is enigmatic enough to support them, whether she's just standing there looking intelligent, or pointing her gun at any Admirals asking for payback who happen to be around. Gina's partner in her Minimate pack, fittingly enough, is Gaius Baltar, arguably her only friend (and it says something about how bad Pegasus was that acquiring Baltar as a friend is an improvement for her). He's looking a touch scruffy, with somewhat unkempt facial hair and his tie loose - he also has red eyes, but that may just be to make them stand out from all the black paint details on his face. His hair is another good translation of the actor's hairstyle into Minimate form, and the Baltar look is completed by a piece that fits over his torso to give him a suit jacket. The jacket piece doesn't close at the sides, beneath his arms, but it does have fully sculpted details of the lapels and pockets, so it's more good than bad, especially if you don't move his arms too far back. Aside from the red eyes - which look fairly natural unless you pay specific attention to them - his paintwork is essentially flawless. His face is painted in a serious expression, with a touch of anxiety (when has Baltar ever not been anxious about something? ), and his unshaven chin is rendered quite well with a range of line widths for the hair, and thicker lines to suggest the shape of his face. His collar and tie are painted, nice and crisp, and the tie's blue is a very good match for the blue plastic of his suit. His silver belt buckle - sculpted and painted - stands out a bit, but not horribly so. Baltar has all the same articulation as his Cylon friend, although the height of the jacket over his shoulders renders his neck balljoint more or less just a swivel, with a very slight amount of tilt to it. His accessory is a book, with the proper Colonial-style angled corners opposite the spine - besides a little sculpted detail to suggest pages, there's no detailing, so it's just a generic Battlestar accessory, suitable for anyone capable of reading (so Helo's out then... yeah, sue me, I like to joke at the big lug's expense). Like all Minimates, Baltar and Gina have Lego-compatible peg holes in the soles of their feet, so if you feel like constructing a base for them, they'll be no trouble to keep standing on it. 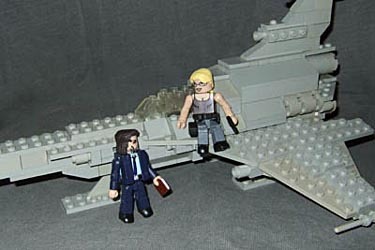 Gina and Baltar come in a well-designed package, with both figures visible in a plastic bubble, and graphics incorporating Battlestar's colours and logo. They're a neat little set, though as a variant, you may find them marked up. Still, this is probably the only Gina we'll ever see, and Baltar makes sense to be accompanying her on her sole foray into merchandising, so it's certainly worth a look.